Many readers commented on the Facebook page, I'm from Taunton regarding our last post. How these memories find a fond place in the hearts of those who grew up in the Village. I feel honored to be a Memory Keeper and do not take it lightly. Often, when I am remembering and writing it feels as if I am transported to that other place in another time. It gives me courage and joy to relive those halcyon times, if only in my memory. There are lessons there, reassurance and knowledge we did not possess before. Following up on the Heirloom Plant trilogy - here are the Matriarch plants we spoke of, still growing strong. green and hearty! These photographs were taken by my sister, Kathleen Souza Campanirio. She is the keeper today of these original living treasures. The plants must know that they are family. 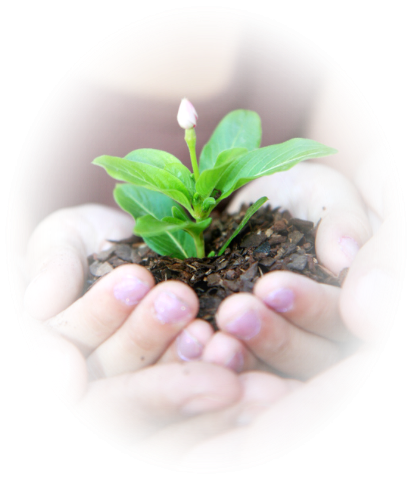 It is no little thing to maintain and nourish these plants and we thank our sister with the very green thumb. She then is the Family Plant Keeper. Stories abide in these plants, stories of generations of Christmas', Easters, Baptisms, weddings and the sorrow of passings. The chimes of children's laughter and the joy of shared remembering live in their roots. The sweet fragrance of Portuguese cooking nourished them and still does. We come and go, we Souza's. We are born and grow and the family grows larger. No matter, the plants remember and cherish...maybe that is what keeps them flourishing. Maybe that is what keeps us flourishing. Love. of course, is the ingredient that maintains us, plant and person alike. 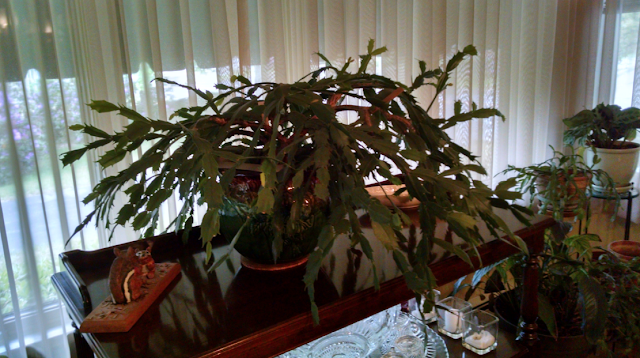 Delphina's original Christmas Cactus- the mama of them all sits proudly in place. When an heirloom such as this likes it somewhere, you do not move it! We believe this plant to be over 100 years old. 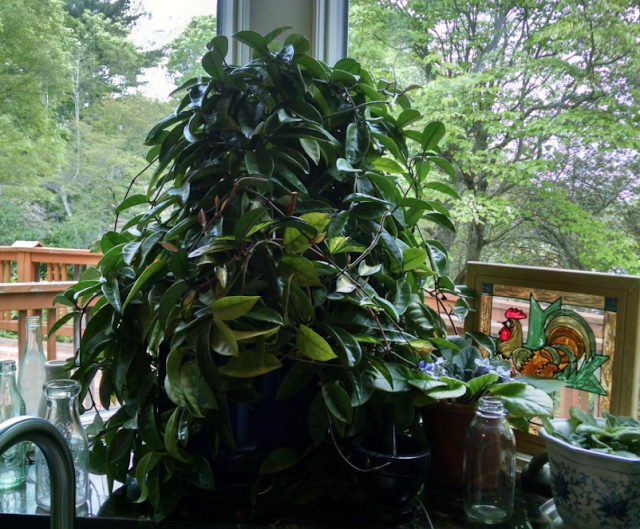 The Hoya plant below is probably around that age as well. The children of this plant are scattered around the country living and being treasured by siblings such as myself, grandchildren, a plethora of cousins and friends. All from this beautiful flourishing plant still living in my sister's sunny kitchen window. These plants are cherished as are its offspring. Living keepsakes holding memories and the touch of loving hands. It never crossed my mind when I started writing about grapevines that this would turn into a trilogy of another aspect of family, another aspect of times gone. Like the leaves of the pages of a Family's history they await discovery and recognition. Their task of remembrance goes on as long as they are kept safe. We are blessed with these that still accompany their families on their journeys. I recently visiting a home with beautiful heirloom begonia plant. It sat in from of its sunny window constantly reminding its present owner of her dear mother. It was shiny and healthy from all the love it has been fed over the generations!